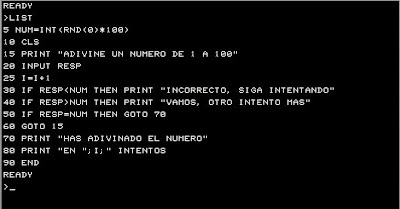 Although I don't have the original source code (It was done more than 24 years ago) and was programmed a little bit after starting computer classes in 6th grade (Sept-1987) I think this piece of code resembles the "game". This game is a guess-the-number kind. Pretty simple but rewarding. For the first time I found that such a device "TRS-80" could be nice source of income and make a living for my future. 1 Year later I learnt how to get some money from my school friends by doing their programming homework. At that time very few people was interested in computers and programming (moreover when you are 12 years old).